Awww, it must be the New Year. The gym is packed to capacity and I’ve just waited 10 minutes for the chin up machine. The “resolutioners” are out in full steam ahead, running on the treadmills till they drop in exhaustion and the buzz of “burning off those Christmas cookies and turkey tummy” can be heard all around. I too was once one of these resolutioners. Actually it was just last year. This year, I did things differently. I came to discover the week preceding Christmas and New Years is the best time to attend the gym. The place is like a ghost town and there is no waiting for any machines. In group classes, such as Zumba (which is usually jam-packed) there is room to cha-cha and Waka Waka without the worry of bumping into the person beside you. So I figured why not get a head start on burning off that turkey tummy? All this got me thinking why I don’t like New Years resolutions. I just finished reading a post on a fabulously informative fitness blog by Eric Bach called www.ericbachperformance.com (if you are looking to shape up and get healthy, I would highly recommend visiting his blog.) Mr. Bach’s post was titled, “Why I Hate New Years Resolutions.” I have to agree with him, as I am not a fan of New Years resolutions myself. Personally, I find that resolutions gave me a pass to gorge myself silly, skip the gym all of December to make merry and then rationalize this by saying, “well it’s the holiday season, and I will make a fresh start on a clean slate in the New Year.” What I realized is that this thinking would only set me back with extra pounds that I would just have to lose in the New Year. At times, I was not ready to implement a serious lifestyle change, but simply felt pressured to do so because it was the new year. Thus, mentally I was not ready, so my resolution would inevitably end up failing by early Spring. I would go in full force in January dieting and exercising, focusing solely on losing weight, but not focusing on being healthy. There is a vast difference. I finally got it when I started this blog in August 2012 and was ready to share my journey. In reality, that is when I made my resolution to change my lifestyle patterns. So this Christmas season, I grazed in moderation on all treats and made sure to attend the gym and not wait until after the peach or the ball drops. Having said all that…. Change can only come when you are ready to embrace it. The resolve to want to make a change in your life can come at any month, January or July. It’s that a-ha moment when you have had enough. Enough of those extra pounds, enough of feeling lethargic, enough of not wearing what you want, enough of the damaging crash diet cycle, enough of not being able to keep up with your kids at the park. That moment is positively palpable, an empowering feeling and is very personal, especially when you have decided to stick to that resolve. Be it now or in August, when that time comes you will feel it, know it. All the weight loss and quit smoking ads are on the TV, “let 2013 be the year you get the great body you deserve,” they promise. Yes, of course you deserve not only a great body, but a healthy body. However, are you ready for the change? 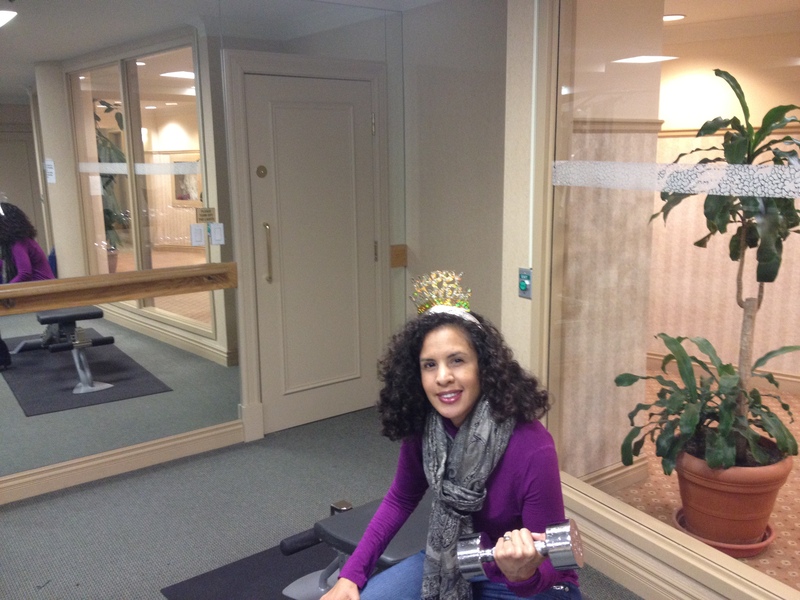 Happy “New You” Year.” If January 2013 is your time, embrace it and rejoice in the fact that you are at this point. If not, I know you will get there soon, and that’s the part that matters most. Perhaps this January is not your time, maybe March or April will be your a-ha moment and that’s Ok, as long as you get there when you are ready. Great pic! Love the crown! I didn’t make any resolutions, but I am definitely doing my first cleanse of 2013 soon! I am feeling lethargic and gross after too much sugar, wine and butter from holiday eating! Great Krys. Let me know what your cleanse entails.